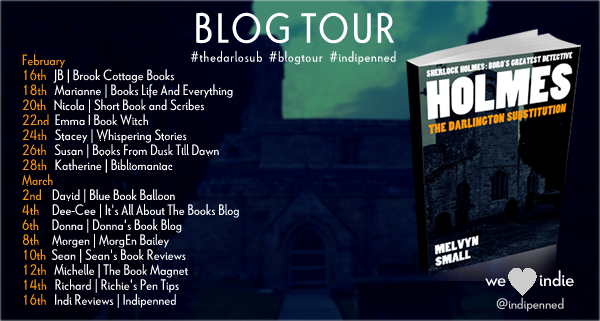 With my cup of excitement gushing over, I would like to announce both the publication of a new and original Sherlock Holmes story and the accompanying blog tour. On the 14th February, yes, it’s a Valentine’s gift to you my lovelies, the first instalment of a completely free, novella length Holmes story will be published on the Indipenned website. Then, from the 16th onwards, Holmes: The Darlington Substitution will be taking a tour of the best book review blogs on the world wide web. I don’t half hope they like it. The Darlington Substitution is my thank you to all of those who supported me during the production and publication of Holmes Volume 1 and 2. In fact, I’ve included some cheeky name drops of those I encountered during that period. If you want to see who, you will need to read it. Let me repeat, it is totally free. I’m not hooking you in with the first chapter. All twelve instalments appear in the sort story section of the Indipenned website and it would be great to see some chatter on the Indipenned Facebook Page as the story progresses. Some early feedback suggests it’s up there with the best of Holmes Volumes 1 and 2. 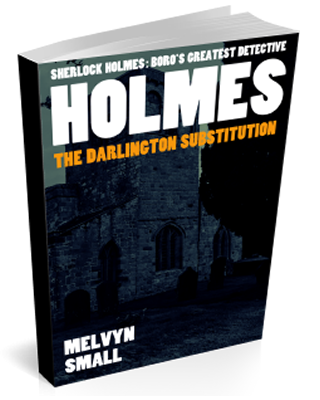 Click here if you would like an email alert when Holmes: The Darlington Substitution hits the Indipenned.